Nothing speaks for The Alkaline Diet better than success stories from our very own customers. will become one of our raving fans. In Nov 2010 I had a rash start on top of my hands In a few days it was cotton ball size up my arms. The more I doctored with many "try this" remedies, the more my arms were burned. It ended up as a chemical burn, not only on my hands & arms but on my neck and half my face and 1 ear. After 2 weeks on your program the swelling was going and we could see "daylight" in between the red. My face and neck were almost completely healed. My ear was still swollen but on its way toward healing. The nay-sayers were paying attention. I was still doing the Alkaline program and adding baths in Epsom salts my arms and hands were healing. It is now the end of May. I am healed. I've lost almost 30 lbs as a bonus. The best part is the response from people who wanted me to go to the doctor. They are speechless. I have no side effects, I'm not addicted to any medicine. It has been a miracle in the making here. Many of them still shake their head and tell me they would have been at the doctors first thing. I told them I wanted to be well, not just get rid of a symptom. I am HAPPY to say that I no longer have welts. For 2 1/2 years I had welts and went to see my doctor and specialist and they didn't know what it was that I had. I researched on the Internet and found some information but loved your website the very best. Considering that I am on Paxil I did lose 4 pounds but have noticed that I look thinner. My skin does look better. I love your diet. I like the fact that you make it sound like we can all do it which we can The other sites that I found would say you can't eat this and this and this. It didn't seem that you could eat anything. You would say don't worry you can this and this. I love the fact that the writing is big. I didn't think that it would matter but I put all the material in a binder and I could read it anywhere without having to read this small print. This is now my bible. I love the fact that you have recipes and I am eating differently now without even noticing. Not drinking with meal, eating one kind of fruit at a time, and eating fruit before a meal. YES, I would recommend this to everyone and I would give it 5 stars out of 5. Keep up the good work and I am so thankful that I found your site. "At first, I was a bit skeptical about the whole idea of having an alkaline diet. After reading, I am quite sure that I know much more than 95% of the people out there. Just by following a few simple tips, my energy levels has improved which makes me enjoy my life so much more. Thank you so much. I highly recommend that everyone should read this and apply everything inside." "I Feel More Healthier, and My Skin Appears Better..."
This plan is helping some, the number one benefit I gained is eating healthier, organic food, which taste better and makes me feel better. I feel more healthier, and my skin appears better, as far as looks, but feels drier, I believe because I had a deficiency of minerals my body lacked for so long, and this change is big, and its a growing process to better health. Thanks so much for this update for breakfasts! I am finally in the 7.0-8.0 range... As per your "book" I urine test several times a day. Because I am choosing this program to stop/halt/change my osteoporosis...it is quite important to me to "get it right". Think I attack all new ventures the same way....full on... full in...all in. Then..it becomes habit and it becomes more natural. But, staying the same and not changing behaviors isn't an option for me. Many thanks for your research, writing, and willingness to be of help and service to others. I am grateful! Hi Emma, this is Hugo, I have already read the Alkaline Diet course and it has helped me very much. There are so much benefits than I have gained such as no more bloating, no more gas and I’ve lost 9 lbs and I have so much more energy. I really like this diet, actually I can't name this a diet is just that right way to eat , the whole information about nutrition is very helpful. Thank you for the email. I am trying to adopt the alkaline diet. I've stopped taking meats for 2 weeks and the heartburn that I used to have is almost all gone. My challenges are finding the right food so your lists are very useful. I have difficulties finding the right food for breakfast. Also, the foodcourts do not sell brown rice and I do depend on the foodcourts for lunch. "After watching my weight yo-yo so many times, I’m glad I finally found a weight loss solution that has not only helped me achieve my weight loss goals, it’s given me the knowledge and help I need to maintain my ideal weight now that I’ve reached it. And on top of all that, following your alkaline diet recommendations has actually led to an overall healthier body for me. By following your simple 12 principles, I’ve made it through allergy season without all the headaches, watery and itchy eyes I experience every pollen season. Your book is truly amazing. 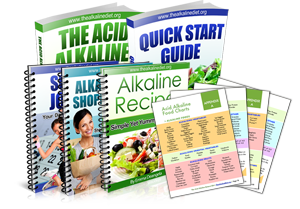 I particularly love the easy-to-follow guide to identifying and choosing acid alkaline foods. It’s taken all the guess work out of making healthy eating choices. I’m glad I read it.